The acting in this film was nothing short of perfection. Specifically, I would like to highlight Michael Keaton and Emma Stone, who I think both gave Oscar-worthy performances. Sheer brilliance. Every word, meticulous, calculating, seductive. While there are no persons of colour in this film, there are 3 strong female characters. The 4th female character is broken and dependent, but still played beautifully by Naomi Watts. Unfortunately,. the only conversation any of the women have with each other is about a man and it ends with them making out with each other. The visual effects in this film were dark and stunning. And they were simple. There were a couple times though where the lighting on Michael Keaton as he was flying around the city didn’t match the rest of the city, so it was obvious that there was a green screen. One of the most perfectly aesthetic and complete cinematographic works I have ever seen. The musical score was purely exquisite. 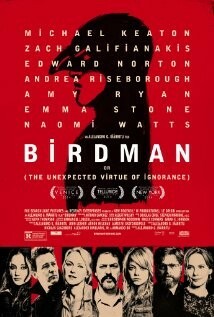 I’ve never purchased a non-lyrical score for a non-fantasy film, but I definitely will be for Birdman. It really is a shame that the Academy nixed it from its shortlist of potential nominees for an Oscar this year. Here we are again. No issues that I could see. Will definitely be swapping this category out just as soon as I can think of something to replace it. This story is relevant for the times and for everyone really. Riggan (Michael Keaton) is a washed-up actor who played an iconic superhero. He is trying to reclaim his past glory by directing and starring in a Broadway production, for which he wrote the script for. But he must overcome issues with his daughter (Emma Stone), the egomania of another actor’s (Edward Norton) method, and his own ego. None of us wants to be forgotten, especially when we were once “something” to the world, and many of us would do almost anything to get that back. Scenes were of a perfect length. If anything this film had too much humility, by way of slightly making fun of itself. This is my favourite film of the year, and I want it to receive any and every award that gets sent its way. Bravo, everyone involved, bravo!